Description: True to his Scottish roots, Huntsman's Creative Director Campbell Carey is a fine connoisseur of precious whiskies. 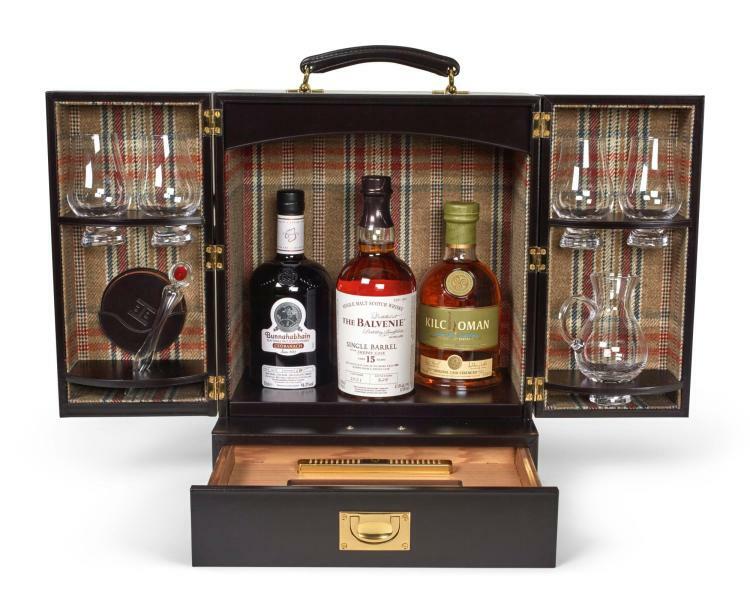 To house his three favourite single malts, Huntsman designed this portable Havana Leather covered cabinet lined in exclusive Huntsman House tweed. Perfect for a picnic or road trip to that special cabin on the lake, included in this lot are four Glencairn whisky glasses, a water jug, an exclusive Huntsman stag head pipette, and four leather and tweed coasters, as well as a bottle of Bunnahabhain Ceobanach Whisky, a bottle of 15 years old Balvenie Single Barrel whisky, and a bottle of Kilchoman whisky, from Machir bay on Islay, home of the Huntsman bespoke tweeds! Featuring a humidor compartment made to house four cigars to enhance the experience. This exclusive Huntsman design has been created in collaboration with Simpson Leather, ensuring the highest quality execution. Condition: New, unused. Please note that alcohol is not for sale to people under the age of 18. Proof of age will be required before collection or delivery.